I got a small aluminium power bank (Figure 1) as a corporate gift. It is one of those 18650 single-cell power banks you can buy on eBay for about 5 bucks. How good are these? Do they meet their specs? Well, let's see. The power bank was fully charged and then a 10cm cable with stripped wires on one end and a USB-A connector on the other was used to connect the power bank to a MightyWatt R3 electronic load (24 A/3 A, 30 V/5.5 V range). A constant current of 0.5 A was drawn from the power bank until it switched itself off. Charge was calculated by integrating the measured current over time and total delivered energy was calculated by integrating the product of measured current and voltage (i. e. power) over time. The voltage drop across the cable was compensated for by measuring the cable resistance and increasing the voltage used for calculation of power by the product of current and cable resistance. The voltage from the power bank varied between 4.85 V and 4.88 V, which means the regulator kept a very stable voltage throughout the discharge and provided voltage high enough to charge devices connected to the power bank. The power bank shot itself down after 2 hours, 14 minutes and 45 seconds after delivering 5.33 Wh of energy and showing a useful capacity of 1.12 Ah at the output voltage, which corresponds to 1.48 Ah at the nominal 3.7 V of the internal battery, not including losses at the internal boost converter. The stated capacity was 2.2 Ah (Figure 2), which means the power bank failed to deliver what it promised and was only able to deliver about 67 % of the stated capacity. Using a ballpark figure of 90 % boost converter efficiency, the power bank delivered 75 % of the stated capacity. Considering the unit was brand new, it is a rip off. Cheap power bank failed to deliver what it promised on the packaging. You can expect about 2/3 of the stated capacity to be really available. That being said, it is actually usable if you take the stated capacity with a pinch of salt and you don't mind that the device does not have any indication of the remaining capacity. This is a test of power handling capability of a really cheap USB cable. How cheap? I don't know because I found this cable in my box of USB cables. I probably got this bundled with some device. What you will find inside this test? A (not so) shocking revelation that chinese manufacturers are able to make a cable with virtually no copper at all. I wasn't really going to test the cable in the first place. I was actually going to test a cheap powerbank I got as a corporate gift. You know, one of those small powerbanks that have a single 18650 cell inside and a boost converter ending in a USB port. And for testing, I needed a cable so I could connect it to my MightyWatt R3 electronic load. So I cut the cable, saving only the USB-A connector end with a few centimetres of cable. Inside, I found four tiny conductors that had barely any metal in them. The USB-B connector was cut from the remaining part of the cable, which was subsequently used for the experiment. The length of the cable for experiment was measured using a tape measure. Both ends of the crappy cable under test (CCUT) were stripped and the foil and braided shielding was removed (Figure 1). 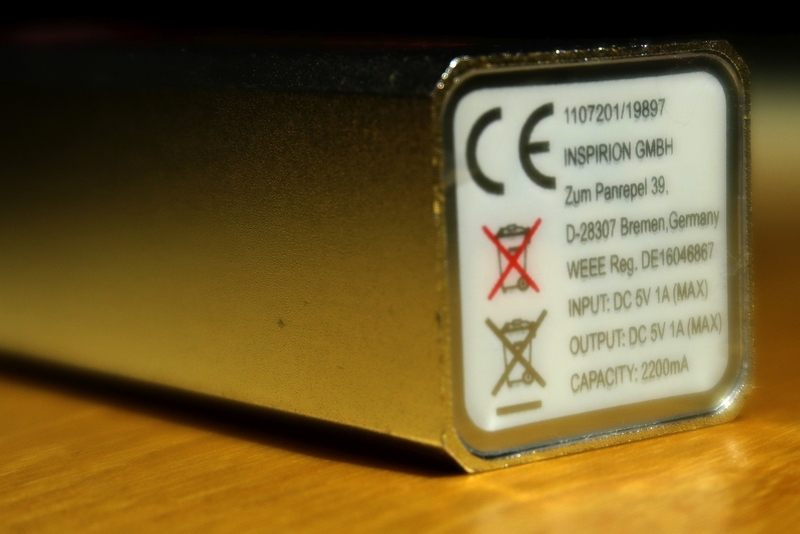 Using the removed part with the USB-A connector, the power conductors were identified to be red (VBUS) and grey (GND). These conductors were stripped to bare copper and twisted together at one end, forming a single conductor. 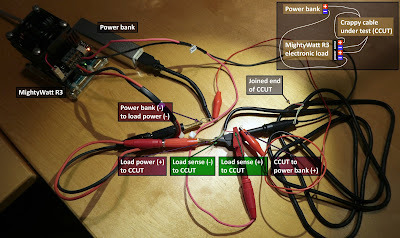 Figure 1: Crappy USB cable and its internal conductors. 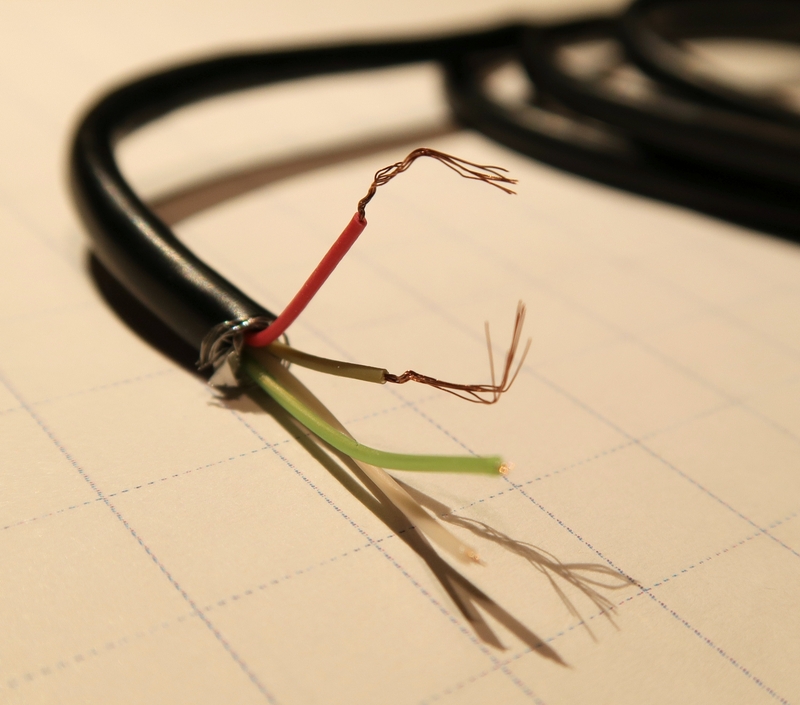 Red wire – VBUS, gray wire – GND. Green and white wire – differential data pair. A power bank was used as the power supply. A MightyWatt R3 electronic load (24A/3A, 30V/5.5V ranges) was used as the measurement device. The positive terminal of the power bank was connected to one end of CCUT, the negative terminal was connected to negative (PWR-) terminal of the load. The other end of CCUT was connected to positive (PWR+) terminal of the load. The voltage-measuring (sense) terminals of the load were connected at the ends of CCUT to measure the voltage drop across it (Figure 2). 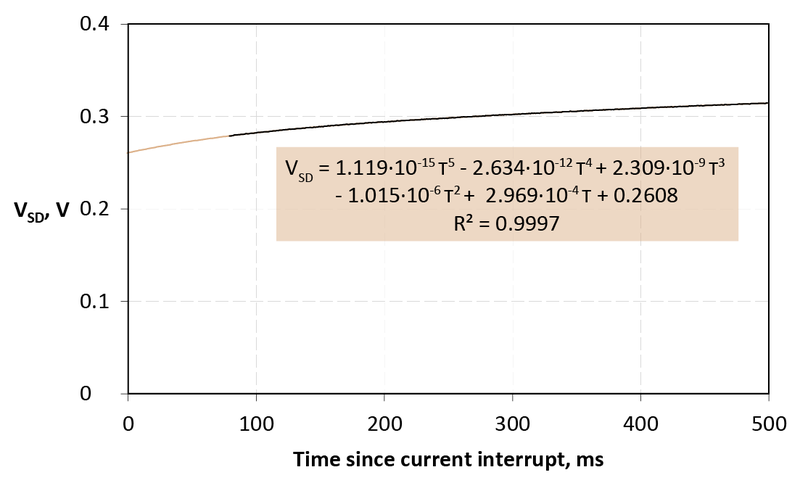 A 30-second linear sweep from 0 to 0.5 A was applied by the load followed by 60-second constant current at 0.5 A. Voltage drop across CCUT was measured as well as the applied current. The resistance was calculated as a ratio of voltage drop and applied current at the beginning of the 60-second constant current phase. The ambient temperature was 22 °C. Approximate cable gauge was estimated from the experimental data using a table on Wikipedia. The total resistance was 3.7 Ω and slowly increasing as the cable was heating up. The length of the cable was 1.55 m so back and forth 3.10 m. That means the specific resistance was a solid 1.19 Ω/m, which is horrible. The wire gauge was approximately 36 AWG and its cross-section around 0.0127 mm2, which can be safely rounded to zero :-) If you really put 0.5 A through this cable, you would get 1.85 V drop, which would probably cause any device supplied from that cable not working. On the bright side, MightyWatt R3 turned out to be great at such an experiment. The accuracy within 1 % was available when the current was a meager 1/180 of the used range (Figure 3). 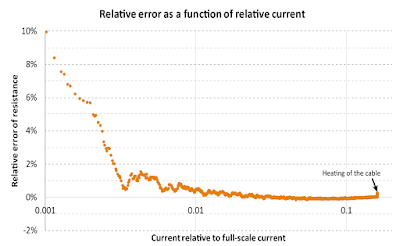 Figure 3: Relative measurement error as a function of current range. Accuracy better than 1 % starts at approximately 1/180 of the current range. Heating causing the increased resistance is visible as the vertical slope at the right end of the curve. Crappy cables are crappy. And at the USB 2.0 maximum current may be totally unusable. May this be a cautionary tale and also an inspiration how to use an electronic load to measure stuff! MightyWatt R3 is a programmable electronic load. That means you can use it for testing batteries, power supplies, fuel cells, solar cells and other sources of electrical power. You can also make a programmable power supply from a fixed-voltage power supply and MightyWatt R3 and use it for example as an intelligent battery charger. 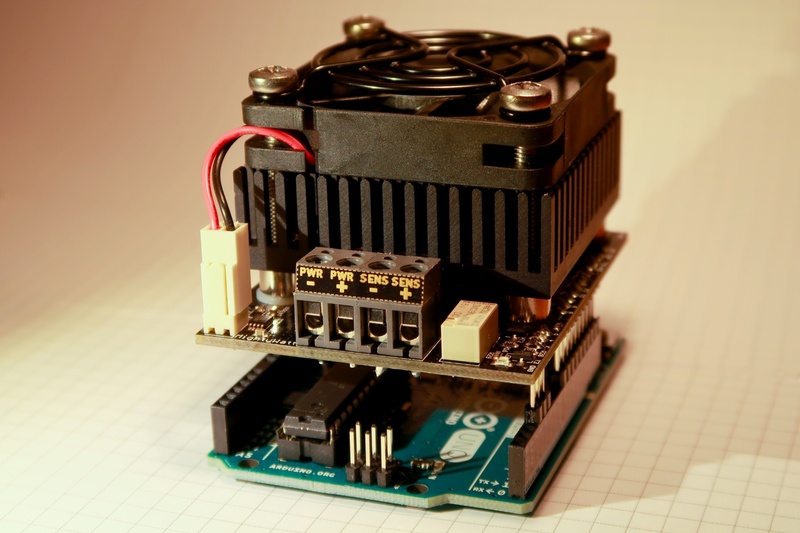 MightyWatt R3 is made as an Arduino shield. Simply put it on an Arduino, upload the control sketch, open Windows control program and you are ready to go. In its heart, MightyWatt R3 has a special FET designed for linear operation that acts as a programmable resistor. It is controlled by an analog feedback loop that is able to keep either constant current or constant voltage (constant power and resistance is kept by a software loop). The current or voltage is set using a DAC, the actual voltage and current is read by an ADC so MightyWatt R3 has an integrated ammeter and voltmeter, both of which have two ranges with very fast autoranging. For the voltage measurement to be as precise as possible, MightyWatt R3 offers 4-wire (Kelvin) measurement where voltage is sensed by a dedicated pair of connections. This removes the effect of cable resistance from the measured value. It is of course possible to measure the voltage at the input terminals too (2-wire measurement). The power is dissipated in a force-cooled heatsink that is able to, with its fan, dissipate up to 70 Watts continuously. Current range is up to 24A and voltage up to 30V. 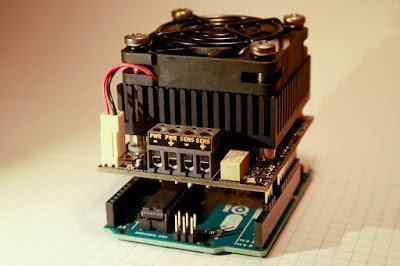 MightyWatt R3 is 100% open source – hardware, firmware, software – so you can make your own one. 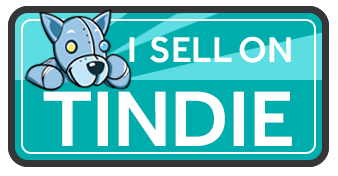 Or buy a ready-to-use unit on Tindie. 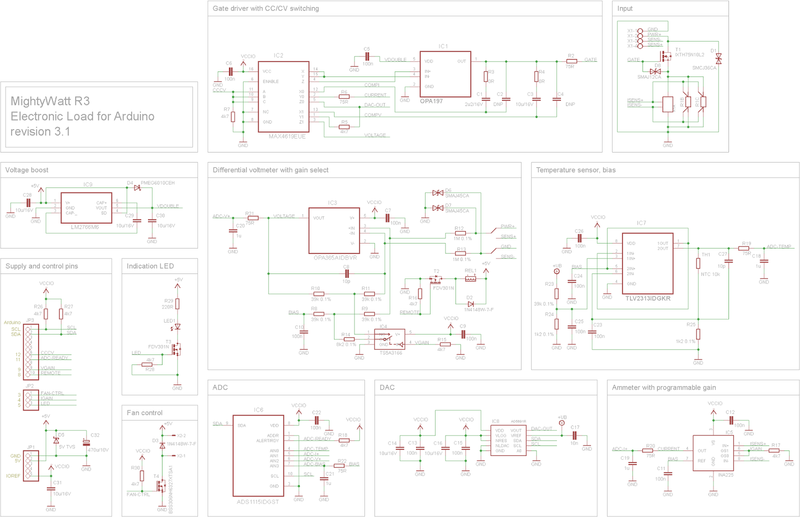 While the revision 2 used Arduino's internal ADC, the new version has a dedicated delta-sigma ADC. Either ADS1115 (16-bit) or ADS1015 (12-bit). This means that the measurements will be more precise, less noisy and the calibration will hold for a MightyWatt R3 as a unit, regardless of the control board (Arduino) used. Both supported ADCs have internal programmable gain amplifier so their resolution is effectively 4 bits larger. However, since they use one half of their range (negative values are not used), one bit is unused so in the end they behave almost like 19-bit and 15-bit devices. 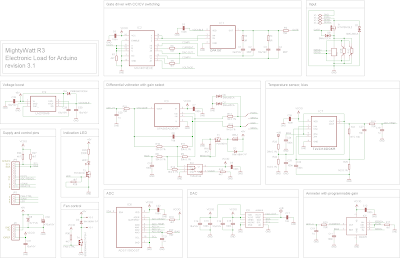 To complement the new ADCs, the DAC can also be a 16-bit AD5693RBRMZ or a 12-bit AD5691RBRMZ (same as in revision 2). Instead of the one current range of its predecessor, MightyWatt R3 has two, separated by a factor of 8. Thus, a 24A version will also have a 3A hardware range. This will enhance the resolution and precision making MightyWatt R3 very usable even at low currents. The current sense resistor will, apart from Vishay WSL3637, now support also Ohmite LVK24 and LVK12 footprints, suitable especially for low currents. 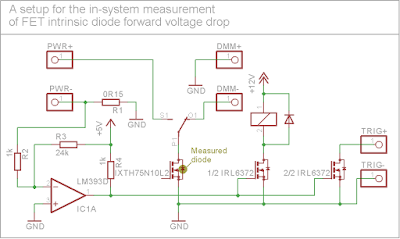 Analog voltage and current measurement have an intentional offset so the rail-to-rail operational amplifiers will remain in their linear range. 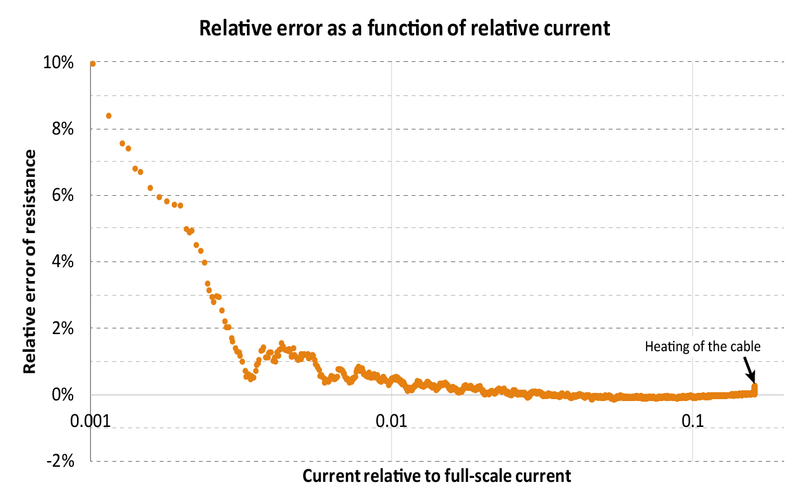 Since both voltage and current are measured differentially against that offset, the measurement is even more precise than the single-ended measurement in revision 2 and the offset is of course completely eliminated from the result. The standard op-amps now include: OPA365 for the voltmeter and OPA197 as the FET gate driver. This is a definite improvement over the TLC2272/LMC6482 op-amp used in revision 2 both in terms of linearity and stability. More stabilization was added to the gate driver so the load is now very stable even with power supplies that have their own feedback for current and/or voltage. The compensation network is different for constant current and constant voltage mode and is automatically selected by the load. There is never too much protection so there are three new transient voltage suppressors – two on the voltmeter and one to protect the gate of the transistor. The standard resistors on the input are 1MΩ, three times the value of the revision 2 resistors. The burden on the device under test will be lower and the measurement more accurate, especially at low currents. The fan can be turned off when the load is small. MightyWatt R3 can dissipate about 10 W without the fan running so for low-power measurements, the fan can be turned off. The firmware will manage automatic turn on when the temperature or power dissipation increases above set threshold. LED is connected to PWM output from Arduino so its brightness can be controlled. Since it has a dedicated transistor now, it has an increased maximum brightness. The communication now uses CRC checking of data integrity. The ADC control module performs filtering using a triangular weighted moving average filter to provide a smoother yet quick response. The main loop makes about 3000 turns per second on Arduino Uno (ATmega328P) and 150 complete measurements (V + I + temperature) per second. The software modes (constant power, constant resistance, constant software-controlled voltage and maximum power point tracker) have been reworked to settle faster. …but the protection logic will disconnect MightyWatt R3 within 10 ms from the time the power exceeded DC safe operating area of the transistor. Calibration sketch has been reworked too and is more automated and informative. And the changes also reflect in the Windows control application. Although most of the improvements lead to both a better accuracy and precision, something the control application has nothing to do with, user can now play with LED and fan rules and enable/disable the smoothing filter. The LED and fan rules work like this: LED will light depending on some pre-defined conditions which can be combined. For example, it can light when the current is over 10% of the range or the temperature is above 50 °C. The fan can automatically turn off with two settings that differ by what they will allow – either put emphasis on cooling (stricter rules) or emphasis on fan noise, meaning turning the fan off as often as possible (relaxed rules). The logic will still turn the fan on if the power or temperature is too high. It can, of course, be always turned on, which is the default setting. Windows application now supports graphs using gnuplot and statistics so you can see how your measurement is progressing in real-time. So all and all, improvements everywhere. It has still the same principle, but it just got way better! Get your MightyWatt R3 on Tindie or make your own one. MightyWatt R3 remains open-source. That hasn't changed and never will. Resistor blackjack is like regular blackjack but better! Your goal is to assemble a single resistance from several resistors that is as close to 21k while not being over. Unlike regular blackjack, the resistors can be combined in series and in parallel, giving the game a whole new dimension. Plus, resistors have tolerances so achieving a mathematical 21k doesn't guarantee a win. The deck resembles card deck except for the ace which has to be a fixed 11k. Put all the resistors in a box and shuffle. Each player should be given an empty breadboard, resistor color code chart (maybe, if you want to be nice) and access to jumper wires. Decide whether to allow calculators. Computing reciprocal values when resistors are combined in parallel can be tedious. Another box with: 5× 100k, 5×330k, 5×470k. A separate larger breadboard as the scoreboard. Start the round by giving each player two random resistors. During the round, each player can ask for up to 4 more resistors (total of 6) but they have to use all of them and assemble them so they form a single resistance. Shorting a resistor is not allowed. At the end of the round, dealer measures each player's assembled resistance. Who is the closest to 21k without being over wins and draws one resistor from the second box. The resistors which players win are connected in series on a separate breadboard (scoreboard) and who is the first to have over one million ohms wins the entire game! Before a round begins, dealer can ask a trivia question. The player who has a correct answer (is first or is the closest if the answer is a number) is given a 20k trimmer which he/she can but does not have to use in the following round. The trimmer is returned to the dealer after the round ends. 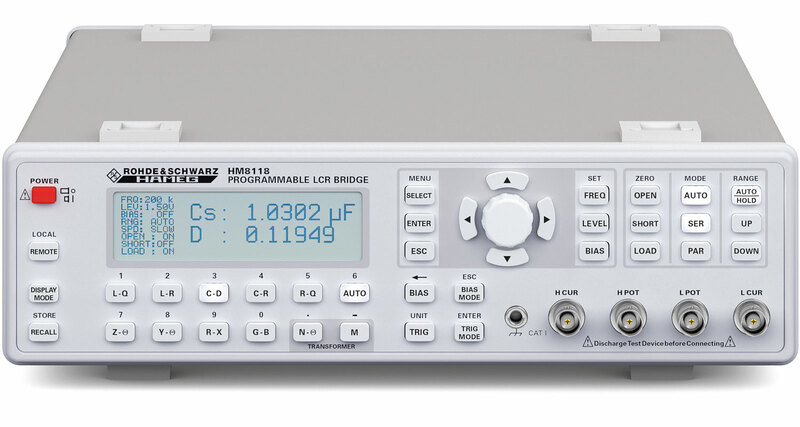 There's a lot of LCR bridges on the market from simple fixed-frequency el cheapo meters made in country where pandas kiss good night to high end thousands of dollars meters made in… well, the very same place. Somewhere in the middle lies Hameg HM8118 LCR bridge from Rohde & Schwarz for about 2300 USD. While the less advanced models only have a couple of frequencies at best, this baby has 69 of them. That makes it suitable for measuring a frequency sweep and then fitting the data to a more complicated equivalent circuit than the two-component model you can use for a single frequency. The frequency range is 20 Hz to 200 kHz and the device has specified accuracy to 100 kHz so the frequencies between 100 kHz and 200 kHz are more of a "bonus". But that does not mean they are completely useless. Just that you can't expect them to be super-accurate. So, how does it work? Normally, the bridge measures the voltage and current through the device under test (DUT), which is typically a resistor, capacitor or inductor. Besides amplitudes, it also measures the phase and from the ratio of amplitudes of voltage and current and the phase difference, it then calculates the impedance. Either as magnitude-phase or resistance-reactance. It is just a different representation of the same quantity. Then, it can apply the knowledge of impedance together with the frequency on a simple two-component model such as a combination of resistor and capacitor or resistor and inductor. Plus, these components can be connected in series or in parallel. That is all math. The device calculates what would be the values of the resistor and capacitor/inductor if they've been connected in series or in parallel and the whole ciruit had the measured impedance at the set frequency. But as you only measure two quantities (voltage and current), you can only calculate two unknowns. If the circuit is more complicated, you need measurements at more frequencies. Preferably, you measure all the 69 available frequencies and then fit the experimental data to the equivalent circuit. Not a trivial task to do but possible. This is the basic operating principle of this LCR bridge. It is a nice unit that, sadly, does not come with a desktop software so you have to rely on the front panel display and buttons which make complicated measurements tedious. Yet, you can connect the device via USB and switch it to a virtual COM (serial) port. Then send commands and read measured values. I have used the serial port feature to create a simple control program in C# (.NET 4.6). It should work on any computer running Vista or higher. It is open source and released under GPL v.3. The project, which also contains the only executable file you need (Hameg8118.exe) is available on my GitHub account. If you just want to know if you can overload your MightyWatt, the answer is yes. You can run it at 75 W constantly and at about 85 W for short periods. Fig. 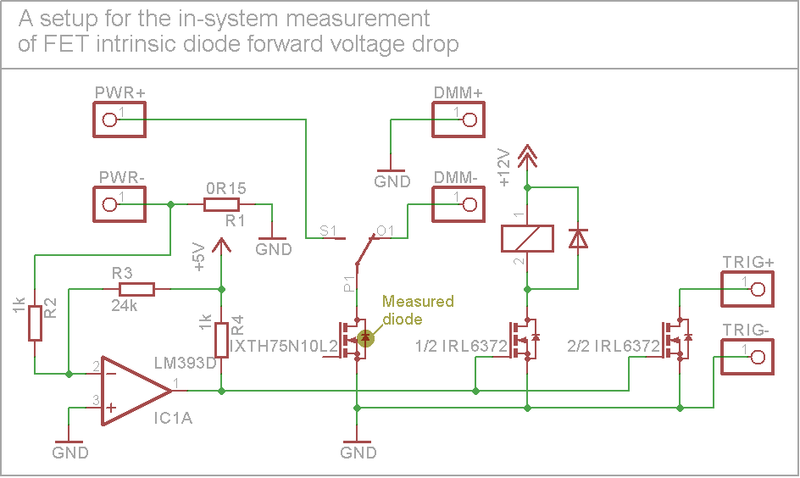 1: Experimental setup for measuring forward voltage drop of a FET body diode. If you want to run a FET at high temperature, which is typical in electronic load applications, it is important not to exceed the maximum junction temperature. In my MightyWatt electronic load, I use IXTH75N10L2 as the main transistor and its maximum allowed junction temperature is 150 °C. It is not easy to measure the junction temperature without actually having a sensor at the junction. Thermal camera, thermistors and other sensors will always measure less because there will be a temperature gradient betwen the case and the junction. At 70 W, the temperature of the copper tab directly attached to the die can be 20 °C less than the silicon temperature! Luckily, there is a way of measuring the junction temperature. Sadly, it cannot be done while the load is operating… Because the temperature sensor is the intrinsic body diode of the FET itself. Its temperature coefficient can be measured in laboratory conditions and then its temperature can be correlated to some other temperature sensor, attached to the body of the transistor. In case of MightyWatt, that is a tiny 0402 thermistor placed beneath the transistor. I have first measured the intrinsic body diode forward drop (VSD) of 10 samples of IXTH75N10L2 at room temperature (about 24 °C) at 1 mA using Keysight 34461A bench-top digital multimeter. Interestingly, they were all the same, at 522 mV. That's good! Seems like the process variation is not very high. Then, one sample from these 10 was randomly selected and fitted with silicone elastomer insulated cables to the drain and source. 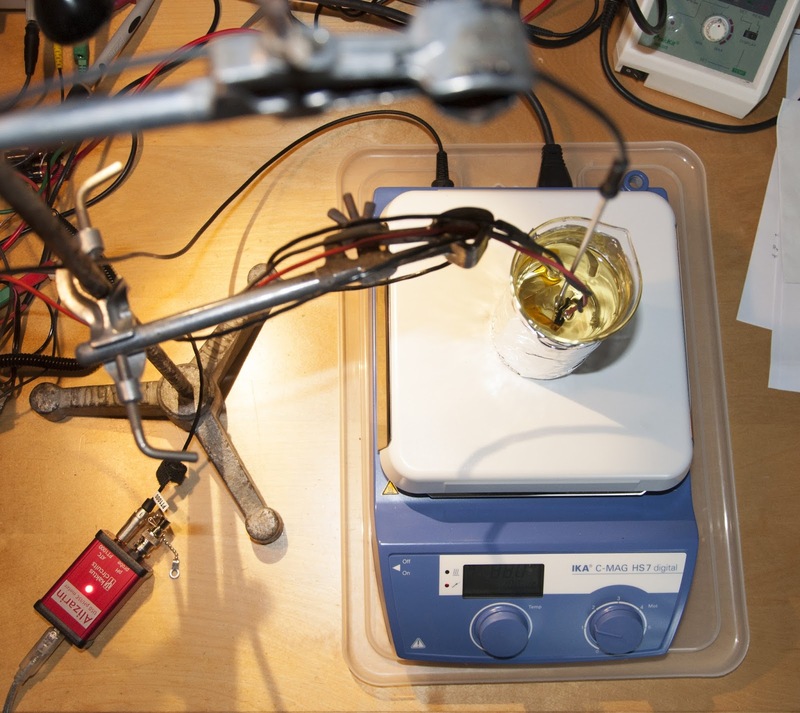 The transistor was then immersed in an oil bath (edible rapeseed oil actually) in a borosilicate beaker with a magnetic stir bar and put on a heated magnetic stirrer (IKA C-MAG HS7) (Fig. 1, 2). 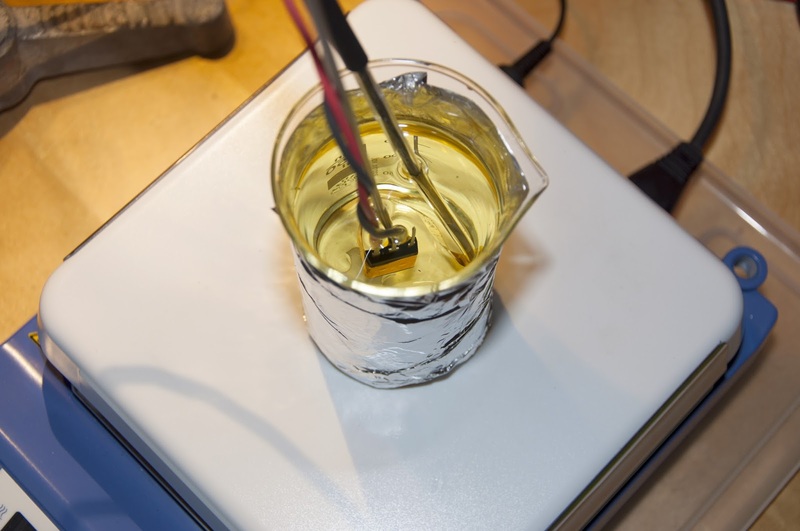 The temperature sensor from the stirrer was Kapton-taped to the metal tab of the transistor. Fig. 2: Transistor in an oil bath with two temperature probes: One from the magnetic stirrer/hotplate and a second, external one for verification. Then, the bath was heated to 60, 70, 80, 90, 100, 110, 120 and 130 °C and when the temperature stabilized, a few seconds worth of experimental values were averaged to get the VSD. The multimeter sampled at about 1000 samples per second. The VSD turned out to be linearly dependent on the temperature with a slope of -2.454 mV/K (Fig. 3). Fig. 3: Temperature dependence of VSD and ideality factor n (which is only discussed in the "extra math" section so pretend you can't see it). First, I soldered wires to the drain and source of one standard MightyWatt's main transistor. The source was at the common ground potential. Because measuring VSD means connecting the polarity in opposite, the drain was connected to a SPDT relay. The normally closed lead was connected to multimeter negative terminal (diode cathode) via a 0.15-Ohm current sense resistor while the normally open lead was connected to power supply positive terminal. Triggering of the measurement was done using a comparator circuit, which was driving one transistor that switched the relay and another transistor which triggered the multimeter. When there was current flowing through the load, the comparator would switch the relay to connect the power supply. When the current was interrupted, the relay switched to measure the VSD (Fig. 4). 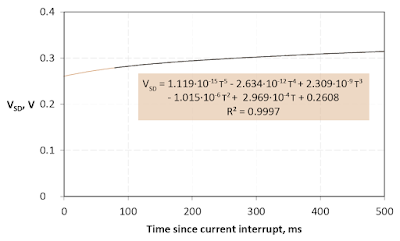 The propagation delay between the current interrupt and the actual trigger signal was measured using an oscilloscope (Rigol DS1052E). Fig. 4: Schematic of the connections for the in-system measurement of VSD. The load was let to dissipate 75.9 W at 3.004 A and I waited until the temperature reported by a thermistor placed beneath the transistor was stable. This took about 10 minutes from ambient temperature. Then, the current was interrupted by physically removing USB cable that powered MightyWatt, immediately interrupting current flow. At that point, the relay switched and multimeter began to measure 2000 samples at about 1000 samples per second. I am only showing the first 500 ms, since the rest was a monotonic increase. Fig. 5: VSD development with time right after the current was interrupted. First 80 ms had to be extrapolated. So the VSD was about 260 mV when the current was interrupted, which means the junction temperature was about 132 °C, well below the maximum. By the way, the thermistor reported 101 °C temperature. The ambient temperature was 26 °C. We can calculate the thermal resistance of the system now: (132 - 26) / 75.9 = 1.4 K/W. While the thermistor thinks it is (101 - 26) / 75.9 = 1 K/W. We should therefore calculate the junction temperature (Tj) from thermistor temperature (Tth) and ambient temperature (Tamb) as Tj = (Tth - Tamb) / 1 × 1.4 + Tamb. Assuming Tamb = 25 °C and Tj = 150 °C, the thermistor will be reporting about 114 °C at this maximum. MightyWatt will report overheat above 110 °C, which seems to be a correct threshold to allow some leeway. The maximum dissipated power is then (150 - 25) / 1.4 = 89 W. And at rated 70 W, the junction temperature is about 70 × 1.4 + 25 = 123 °C. But there is one catch: The Arctic Silver AS5 thermal paste (which I use) is rated 130 °C continuously (180 °C for short periods of time). The temperature at the thermal paste is unknown because datasheet only quotes maximum junction-to-case thermal resistance. 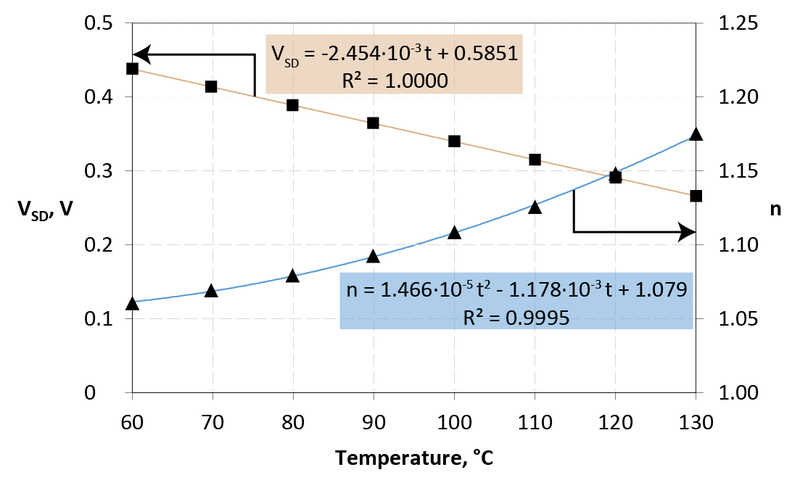 Using the maximum value, the case temperature at Tj = 150 °C will not be less than 122 °C. But probably it will be higher, possibly exceeding the long-term rating of the thermal paste. So to be perfectly safe, let's assume the Tj to be 130 °C maximum. At this temperature (and 25 °C ambient), the maximum continuous power dissipation is (130 - 25) / 1.4 = 75 W.
We should leave some safety margin because the extrapolation might not have been very precise and the Tj could have been higher. But advertising MightyWatt as a 70 W load seems to be honest, if a little conservative. And don't worry overloading it for extra 15 W for short experiments. You will have to change the maximum power in the sketch though. Besides direct measurement, the VSD can be calculated using Shockley diode equation (1), where I is the diode current (1 mA in this case), IS is the reverse bias saturation current, n is the ideality factor, typically between 1 and 2, and VT is the thermal voltage equal to kT/q, where k is the Boltzmann constant, T is the thermodynamic temperature and q is the elementary charge. IS is temperature dependent and is approximately equal to (2), where Eg is the bandgap energy. The bandgap energy also depends on temperature and can be calculated from (3), with experimentally determined parameters Eg(0) = 1.166 eV, α = 4.77·10-4 eV/K and β = 636 K.
Combining equations 1, 2 and 3 with the experimental data permits the calculation of the only remaining unknown – the ideality factor n – which was calculated to be between 1.061 and 1.175 for the temperature from 60 to 130 °C (Fig. 3). The value of n indicates that the current was limited mainly by the recombination of minority carriers in the neutral region. Thermal fluxes in systems like transistors on an active heatsink are complicated. The heat emerges from a relatively small region made of silicon and is then preferentially conducted via copper tab to the back of the transistor case where a heatsink is attached. The silicon content is very low compared to the lead frame and encapsulant, which contribute to almost the entire heat capacity of the device. IXYS does not publish information about the material composition of the transistor but a similarity can be assumed with other parts in the same package. International Rectifier publishes Bill of Materials for TO-247 packaged transistors. The main mass (66.2 %) of the transistor is the copper lead frame. The other significant contribution is the epoxy resin, that is composed mainly of a filler – SiO2. These two materials account for over 90 % of the overall mass. The silicon content is a meager 0.6 %. The total weight of the transistor, as reported by International Rectifier, is 5.6 g. The IXYS IXTH75N10L2 was somewhat heavier at 6.4 g.
This permits us to calculate the approximate heat capacity of such transistor. The specific heat capacity at 127 °C of Cu, SiO2 and Si is 398.6, 889.2 and 788.3 J/kg/K respectively. Assuming the balance to 100 % has the same average heat capacity as the two main components, the overall heat capacity of the International Rectifier transistor is approximately (398.6 × 0.003719 + 889.2 × 0.001411)/0.913 = 3.00 J. Scaling this to the IXYS transistor, the heat capacity could be about 3.00 × 6.4/5.6 = 3.43 J. Assuming the transistor is evenly heated and thermally conductive, the 80 ms delay at 75.9 W of cooled power would cool it by 1.8 K. However, such assumption is never true because the materials have different thermal conductivity and the heat distribution is uneven, with the maximum at the junction. Besides that, the silicon part has very low heat capacity because it is very small and the thermal path is mainly through the copper to the heatsink. 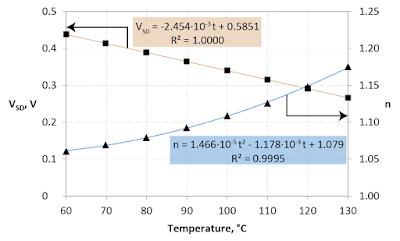 There is a large temperature gradient from the junction to case at 75.9 W. According to the datasheet, the junction-to-case thermal resistance is up to 0.31 K/W, which creates a gradient of 23.5 K at 75.9 W. The extrapolation of junction temperature, even to a time only 80 ms before experimental points, is not trivial and in this study was done by simply fitting the VSD vs. temperature curve with a 5th order polynomial that accurately tracked the experimental data (Fig. 5). Well, if you read all of this, you really pushed it to the limit. Go ahead, you deserve it!